I cut the card bases in the kit in half and mounted them onto solid color cardstock bases. On the Smile card I just used a 2" piece of the original striped card base to tuck behind the die cut word, and I popped the white layer up on some dimensionals. 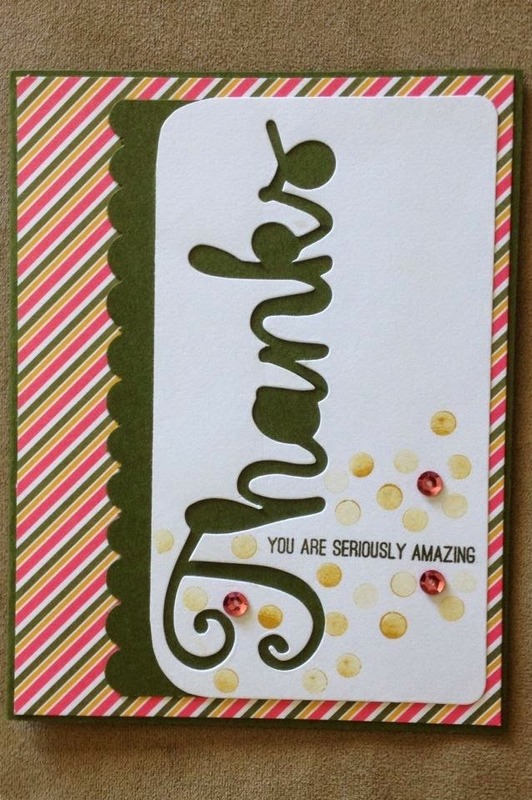 I stamped it with two stamps from the kit, the dot and the saying You Are Seriously Amazing, and added sequins. Not too far off from the original design, but I got some extra streach out of the supplies by splitting up the card base. This card I used half of a card base from the kit, mounted onto a Mossy Meadow base, with a Mossy Meadow layer under the die cut word. 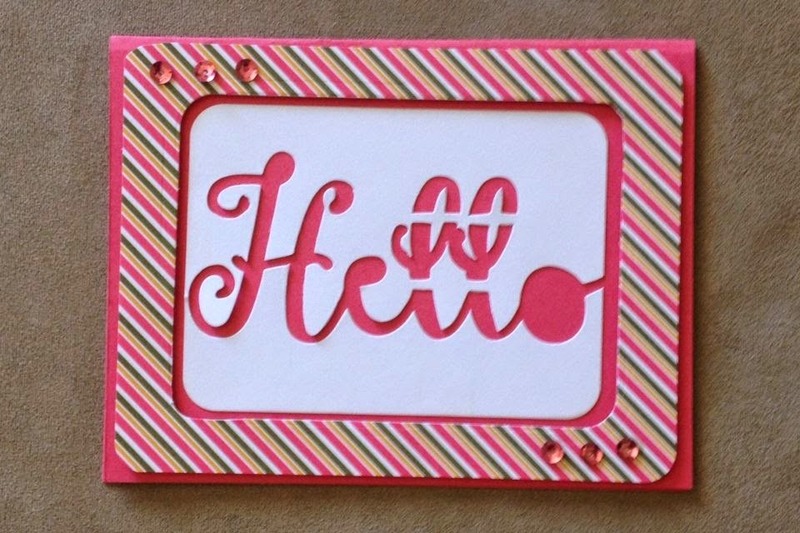 I flipped the diecut to the side, and cut the green layer with a Scallop Border punch. 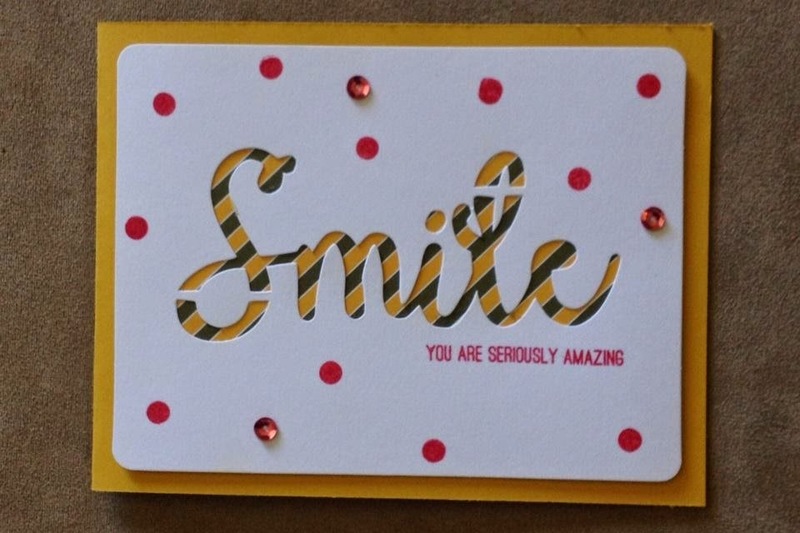 The sentiment You Are Seriously Amazing is tucked into the die cut space, and I stamped some Hello Honey dots around to draw attention to it. A couple sequins finish it off. This card was tricky. I wanted the diecut center of half of the base to be a little larger than the die cut of the word. I used the Project Life Framelits to cut them, repositioning and shifting the die to shave a little extra off the sides. I popped the stiped base up with Dimensionals, and then placed the white word in the center onto the Strawberry Slush base. Added some of the pink sequins. I hope your encouraged to try something new with the kit supplies, you don't HAVE to follow the included instructions. The supplies are top quality and fun to use to challenge your creativity. Even if you are an 'Advanced' crafter and feel these are intended for new crafters (( They Are!! :-)) I think you can still find value and motivation with each monthly kit. Its good to have an easy craft to fall back on for those stressful days - everything is included in the box, no searching for supplies, or getting out the whole kit and caboodle... Just open the box, and enjoy a quick 30 minute project with all the work done for you. Instructions, precut, prescored, self adheive die cut pieces or included adhesives, all embellishments... Make it easy on yourself! I love the playful nature of these kits, I really hope you take advantage of the special HALF OFF Offer and try it out! No obligation, get Half Off your forst two months, and then you're free to cancel... Or - enjoy a membership with flexibility. You can suspend your service, order a kit every other month, or get a few kits to have a fun little craft party with your relatives or friends! The work is all done for you - Skip to the Fun!!! To try it out, sign up HERE and be sure to include the Promo Code HALFOFF2 when you are registering. Have questions? Drop me a note and let me explain the subscription service, I've been a member for over a year and I am loving it!